We microzoned seismic hazard of the City of Kolkata, India by integrating seismological, geological and geotechnical themes in GIS which in turn is integrated with the vulnerability components in a logic-tree framework for the estimation of both the socio-economic and structural risk of the City. The cumulative damage probabilities in terms of ‘none’, ‘slight’, ‘moderate’, ‘extensive’ and ‘complete’ have been assessed for the predominantly four model building types RM2L, RM2M, URML and URMM. Extreme value analyses of sea-level using tide-gauge measurements usually suffer from limited effective duration of observation which can result in large uncertainties, especially when outliers are present. To tackle this issue, a Bayesian MCMC method is developed integrating historical data in extreme sea-level analyses. A real case study shows a significant improvement in return values estimation and the usefulness of the Bayesian framework to predict future annual exceedance probabilities. After the Lushan earthquake, Ca2+, HCO3- and TDS of spring water increased significantly, which may be attributed to the enhanced interaction between water and carbonate rocks by the increment of dissolved CO2. Na+, Cl- and SO42- in water from Guanding, Zheduotang, Xinxing and Gonghe springs decreased, which may be related to the dilution of precipitation water. The increase in Na+ and SO42- in water from Erhaoying spring may result from a greater increase in sulfur-rich groundwater. Using census data, historic maps and hydrodynamic modelling, this paper presents a methodology for assessing how the exposure of people to flooding has changed over the last 200 years at the local level in the UK. The method is applied to two case studies at Portsea and Hayling Islands in the UK's Solent region. The analysis shows that for the case studies, population rise has, to date, had a much greater influence on exposure than sea level rise. Icebergs are a natural hazard to maritime operations in polar regions. Iceberg populations are increasing, as is the demand for access to both Arctic and Antarctic seas. Soon the ability to reliably track icebergs may become a necessity for continued operational safety. In this paper we describe the design of a tracking sensor that can be deployed from an aircraft during surveys of Antarctic icebergs, and detail the results of its first deployment operation on iceberg B-31. 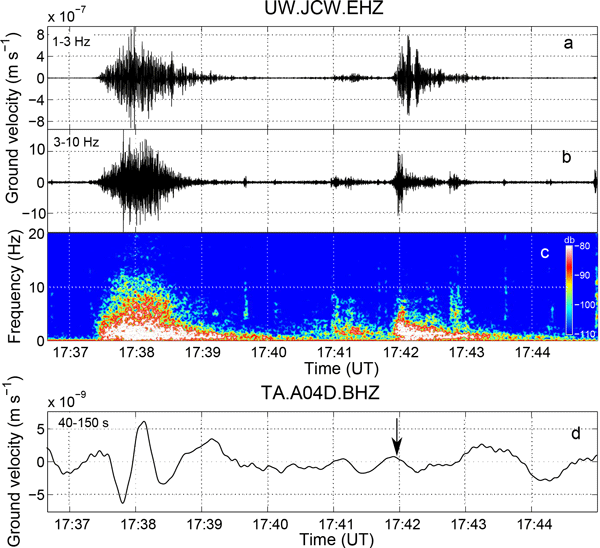 The developed numerical inversion technique based on the least square inversion and a truncated SVD approach were applied to recovering the initial tsunami waveform. The method presented allows one to control the instability of the numerical solution. Analyzing the singular spectra of the matrix obtained during numerical calculations one can estimate the future inversion by a certain observational system that will allow offering more effective disposition for the registrators by precomputations. We carry out a study of the seismic signals generated by the devastating Oso-Steelhead landslides. We invert the long-period seismic signals generated by the first main event and obtain estimates of its trajectory, kinematics and mass. No distinct long-period surface waves were recorded for the second failure, which prevents inversion for its source parameters. However, from the comparison of the energy of the short-period waves generated by both events, we can estimate the volume of the second. Snow avalanches break, uproot and overturn trees, causing damage to forests. In this paper, we define avalanche loading cases representing four different avalanche flow regimes: powder, intermittent, dry and wet. Using a numerical model that simulates both powder and wet snow avalanches, we study documented events with forest damage. We find that powder clouds with velocities over 20m/s break tree stems and that quasi-static pressures of wet snow avalanches are much higher than dynamic pressure. A coupled empirical approach for studying possible correlations among rainfall, vegetation segmentation, and landslide occurrence is applied over the Esino river basin, central Italy. This approach represents an attempt to find both the timing and location of landslides, through an empirical (black box) analysis. Results verify an intensity-duration minimum threshold for the study area (when) and define core areas and fragmented vegetation structures most susceptible to landslides (where). Flood hazard maps are crucial for flood risk management. Since flood hazard is a multi-dimensional phenomenon, many different maps could be relevant. Having a large number of maps to take into account does not, however, make planning easier. To support flood risk management planning we therefore introduce a new approach in which all relevant flood hazard parameters can be combined into two comprehensive maps of flood damage hazard and flood fatality hazard. This paper identifies key infrastructure and their functions and status to provide an overall picture of relative vulnerability to climate-related stresses on infrastructures in Samoa. An indicator-based vulnerability model (SIVM) was developed to assess two major issues a) criticality of a given infrastructure, viewed differently among different stakeholders, and b) stakeholders, the best available source, could estimate the capacity to repair non-physical damage to such infrastructure. There is little knowledge on the meaning of different hydro-meteorologic drought indicators for drought impact occurrence on the ground. This study investigates the link between commonly used drought indicators and text-based information on drought impacts through data visualization, extraction of indicator values concurrent with impact onset, and correlation analysis for the case study area Germany. The results demonstrate the feasibility of evaluating drought indicators with impacts. The objective of this paper is to demonstrate the applicability of ground-penetrating radar (GPR) for monitoring the displacement of permanent slow-moving landslides affected by seasonal kinematic pattern and acceleration events. GPR data are used here to estimate the vertical movement of two rotational slides, since 1982, in combination with other surveying techniques. We have developed a global database of daily, gridded Fire Weather Index System calculations beginning in 1980. 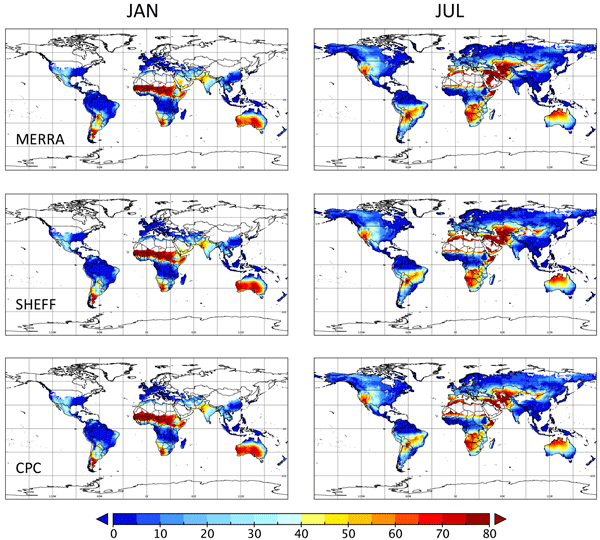 Input data and two different estimates of precipitation from rain gauges were obtained from the NASA Modern Era Retrospective-Analysis for Research and Applications. This data set can be used for analyzing historical relationships between fire weather and fire activity, and in identifying large-scale atmosphere–ocean controls on fire weather. This work discusses the legal consequences of risk and crisis communication. It focuses on three critical issues: the development of effective communication protocols; the role, tasks and responsibilities of science advisors; and the collateral effects of practitioners’ defensive behaviours. The conclusion presents some ideas for future research on the legal aspects of risk communication.